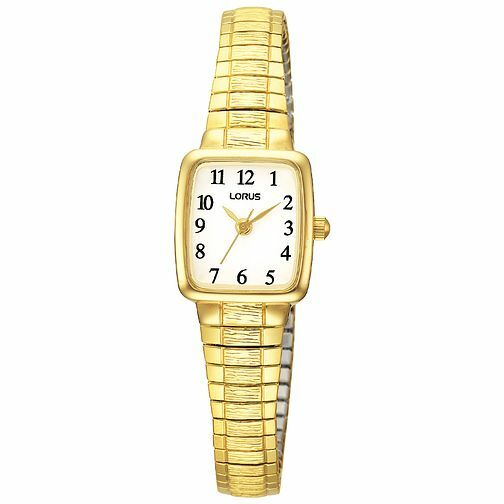 Lorus ladies' gold-plated expander bracelet watch. An elegant timepiece for an elegant woman. Lorus Ladies' Gold-Plated Expander Bracelet Watch is rated 5.0 out of 5 by 2. Rated 5 out of 5 by Anonymous from Elegant and reliable everyday watch Easy to wear with the expanding bracelet. Easy to read display. Classic and simple style. Perfectly acceptable finish and quality for the price. It won't tell you how unfit you are, make a phone call or turn on your heating at home while you're out so if you just want something pretty and functional to keep time you can't go wrong with this lovely little watch. Rated 5 out of 5 by Anonymous from This watch has just what I was looking for. I chose this watch as it has expandable bracelet & gave the measurement of this bracelet which is helpful when you have small wrist. Also the watch face nice & small but still easy to see the time. Would definitely tell people where I brought it & that it comes with a choice of silver or gold feature face.